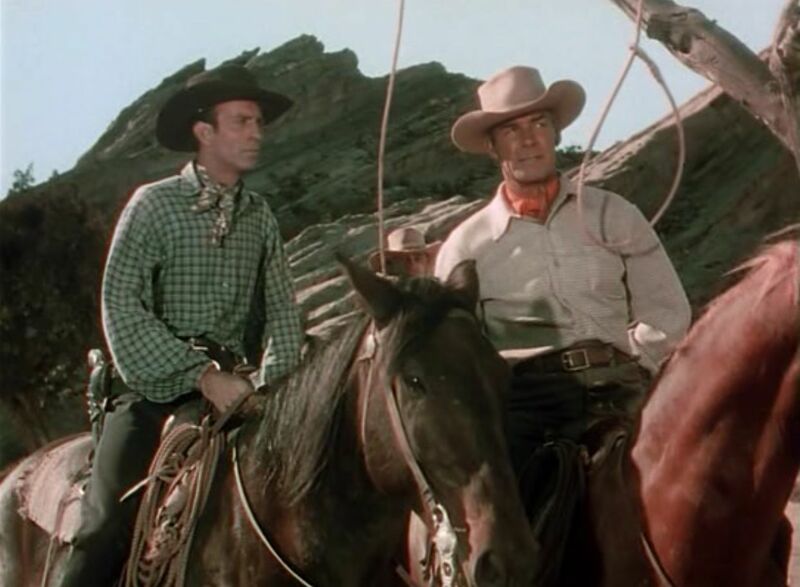 Return of the Bad Men was the fourth and final film in a series of westerns that director Ray Enright made with legendary horse opera star Randolph Scott. The previous three were Trail Street (1947), Albuquerque (1948), and Coroner Creek (1948). Most modern viewers will know Randolph Scott primarily for his final role — in Sam Peckinpah’s Ride the High Country (1962) — and be blissfully unaware of the roughly one hundred films he appeared in prior to it. Ride the High Country is a great western (it co-stars Joel McCrea), but it’s not Scott’s only claim to fame. The westerns he made in the ’50s with director Budd Boetticher are highly regarded among connoisseurs of western cinema. He also appeared in plenty of workmanlike westerns like the ones directed by Ray Enright that aren’t great works of art, but are well-made entertainment, and a cut above the average B western. Return of the Bad Men takes place in 1889, in the Oklahoma Territory. The U.S. government has just opened up two million acres of prime land for settlers. At high noon on April 22, 1889, the great Oklahoma Land Rush will begin. On the tails of the settlers, however, are a bunch of no-good outlaws (the “bad men” of the title) who only hope to prey on honest folks. The land run sequence is exciting, although I suspect that most of the footage is taken from an earlier RKO picture, the Oscar-winning Cimarron (1931). One of the settlers is a beautiful young widow named Madge Allen (Jacqueline White) who has a young son named Johnny (Gary Gray). She also has a boyfriend, Vance Cordell (Randolph Scott), who only wants to marry his sweetheart and move her and her son out to California. But when Madge’s father, John Pettit (Gabby Hayes), the folksy and tough-talking president of the local bank, picks up stakes and moves from Braxton, Oklahoma, to Guthrie, Oklahoma, Vance, Madge, and Johnny follow. Once in Guthrie, a cavalry officer appoints Vance U.S. Marshal. As a former Texas Ranger and peace officer, he’s the most suitable man to keep order. Madge just wants her son to grow up in a peaceful, law-abiding world. Her deceased husband was a peace officer killed in the line of duty, and she refuses to marry Vance until he puts things right in Guthrie, trains officers to take his place, and retires. Meanwhile, a whole mess of outlaws is amassing against the peaceful homesteaders of Guthrie. They’re led by Wild Bill Doolin (Robert Armstrong) and there’s even a woman among them, Doolin’s niece Cheyenne (Anne Jeffreys). When the rough-and-tumble bad men tell her that busting banks is man’s work, she responds that Belle Starr did OK. The crew of outlaws includes plenty of famous names — the Younger brothers, Cole (Steve Brodie), Jim (Tom Keene) and John (Robert Bray); the Dalton brothers, Emmett (Lex Barker), Bob (Walter Reed), and Grat (Michael Harvey); Billy the Kid (Dean White); the Arkansas Kid (Lew Harvey); Wild Bill Yeager (Tom Tyler) — but the only member of the crew who has much of a chance to distinguish himself (besides Cheyenne) is Robert Ryan as the Sundance Kid. Sundance is the most vicious of the lot and becomes Vance’s archenemy over the course of the film. Robert Ryan was on his way to becoming a big star after his memorable role in Crossfire (1947). There’s nothing particularly remarkable about his role in Return of the Bad Men, but he plays a charming villain well, and the growing antagonism between Ryan and Scott provides the dramatic push of the film. Enright keeps the pace fast in Return of the Bad Men. The editing is quick, and the camera frequently moves within shots, which is not the case with a lot of B westerns. 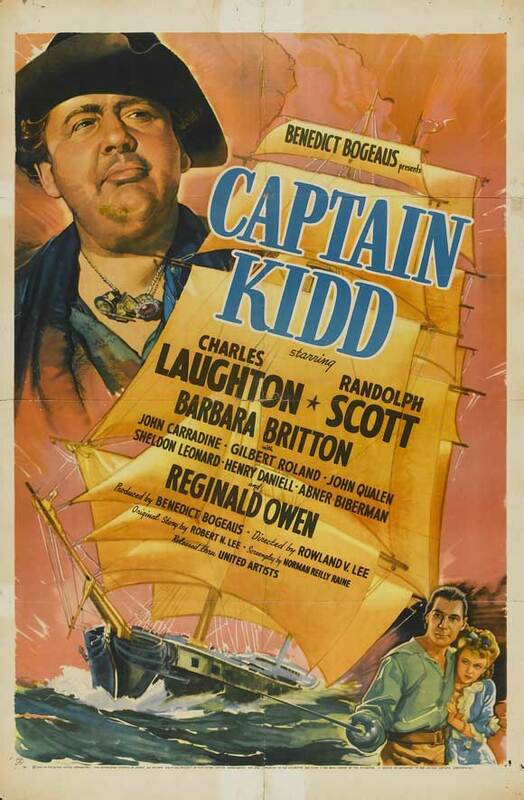 For a B western the production values are good, the acting is solid, and the characterizations are well-done. Posted in 1948, July 1948 and tagged Anne Jeffreys, George "Gabby" Hayes, Jacqueline White, Randolph Scott, Ray Enright, RKO Radio Pictures, Robert Ryan, Westerns. Bookmark the permalink. Another day, another western based on a Zane Grey novel. 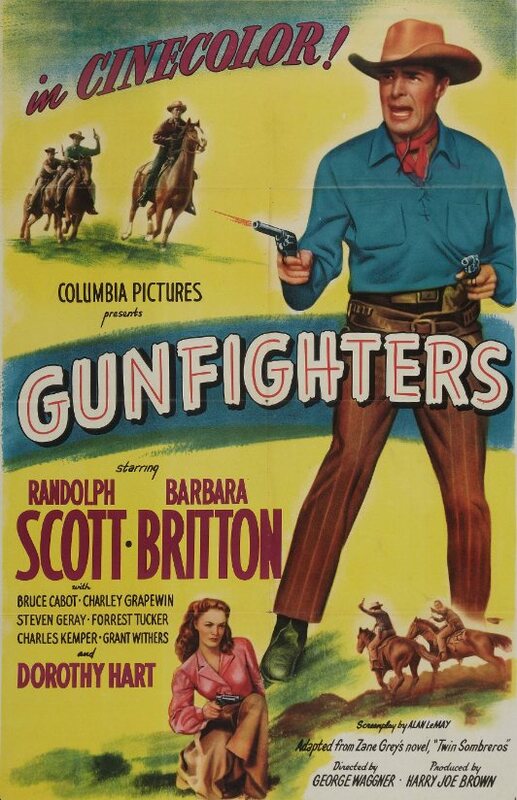 Unlike the last movie I watched that was based on a book by Zane Grey — Thunder Mountain, which was a fun little 60-minute black and white western from RKO Radio Pictures — George Waggner’s Gunfighters gets the prestige treatment from Columbia Pictures. It’s a feature-length film (almost 90 minutes long), and it’s shot in Cinecolor. Cinecolor was a two-color film process that was cheaper than Technicolor, and could sometimes look washed-out or unnaturally reddish, but Gunfighters looks great. 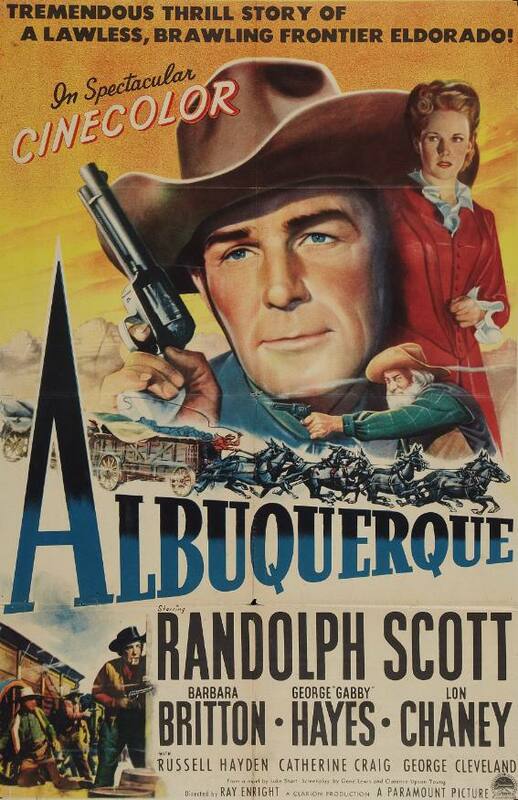 For what it is, the production values are high, and legendary cowboy star Randolph Scott is always fun to watch. In Gunfighters, which is based on Zane Grey’s posthumously published novel Twin Sombreros, Scott plays a seasoned gunman with the unlikely name of Brazos Kane. Brazos is the veteran of so many shootouts that as soon as the opening credits are done rolling, his best friend steps out of a cantina, calls him out, and Brazos is forced to kill him. As his friend lies dying, he offers no explanation for starting the duel. In the world of Gunfighters, gunmen are like mountain climbers — ask mountain climbers why they want to climb a mountain, and they’ll respond, “Because it’s there.” Likewise, Brazos’s friend just had to know who was the faster draw. But it’s the same everywhere he goes — the Texas Panhandle, Wichita, Dodge — so Brazos heads for the Inskip Ranch, where he plans to ride the range with his old friend Bob Tyrell. And that’s just what they do. After Brazos arrives at the Inskip Ranch, he and his old buddy Bob herd cattle, bust broncos, sleep under the stars, start their days with strong coffee and hot biscuits, pass a jug of whiskey around the campfire at night, tell tall tales, and live happily for all the days of their life, making Gunfighters unique among ’40s westerns, since it contains almost no gunplay or violence. Ha ha! Just kidding. As soon as Brazos shows up at the Inskip Ranch, he finds Tyrell’s corpse facedown in a creek. And even worse, he’s immediately blamed for the murder, and finds himself on the wrong end of a lynch mob. Gunfighters has plenty to recommend it. It looks good and contains some of the most impressive chases on horseback I’ve seen in a western. But for every exciting five-minute stretch there’s a boring one, and the final showdown between Brazos and the bad guys seems to take forever to get to. I enjoyed the performances of both Dorothy Hart and Barbara Britton, who play sisters Jane and Bess Banner. Most of the humor in the film comes from the fact that the two sisters look enough alike to be mistaken for twins, and there’s plenty of cases of mistaken identity, if that’s your thing. Forrest Tucker, who is probably best remembered for playing Sergeant O’Rourke on the TV show F Troop, makes a great sneering bad guy, but the other major villain, Bruce Cabot (of King Kong fame), never makes much of an impression. Posted in 1947, July 1947 and tagged Barbara Britton, Bruce Cabot, Columbia Pictures, Dorothy Hart, Forrest Tucker, George Waggner, Harry Joe Brown, Randolph Scott, Westerns, Zane Grey. Bookmark the permalink.